By setting the cell’s internal “clock”, circadian rhythms are central to many cellular activities such as carbon metabolism and the cell cycle. Therefore, a detailed understanding of these rhythms is crucial for determining how to maximize the effectiveness of drugs and treatments for a variety of diseases. However, traditional methods for studying circadian rhythm, such as race tube analysis and fluorescent labeling, are only capable of observing the overarching rhythm in a large population of cells. They lack the resolution required to observe the clock in individual cells. We need to develop a new technique for tracking the activity of individual cells that has both versatility and accuracy. 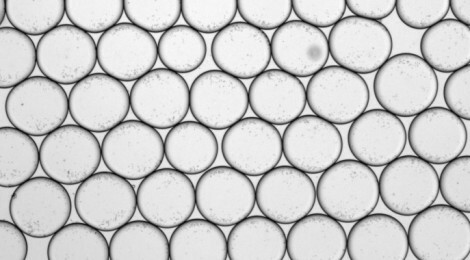 Progress in the field of microfluidics has led to a new method for isolating individual cells into droplets so that they can observed without interference from other cells. Using a PDMS droplet microfluidics device, we were able to gather data on the circadian rhythms of hundreds of isolated single cells. Preliminary data indicates that single cells do indeed have an intrinsic rhythm but it tends to be very noisy and stochastic. When the circadian rhythms of small (2-3 cell) clusters were observed, there was a noticeable decrease in the amount of noise in the system. Consequently, it was easier to see the circadian rhythms in these small clusters of cells. This leads us to the conclusion that a cellular communication mechanism may help to explain how stochastic and damping behaviors, common to single cell circadian rhythms, can be sidestepped so that cells synchronize en masse. Further investigation into this communication mechanism could yield crucial insight into how cells are able to work together synchronously at the organismal level.